According to reports, the Canadian Chiropractic Association (CCA) holds regular meetings twice yearly referred to as the Canadian Chiropractic Associations' Presidents' Meeting. The principals involved in the meeting of this Canadian Cabal include all the Provincial association presidents, the Canadian Chiropractic Protective Association and leaders from the Canadian Memorial Chiropractic College. 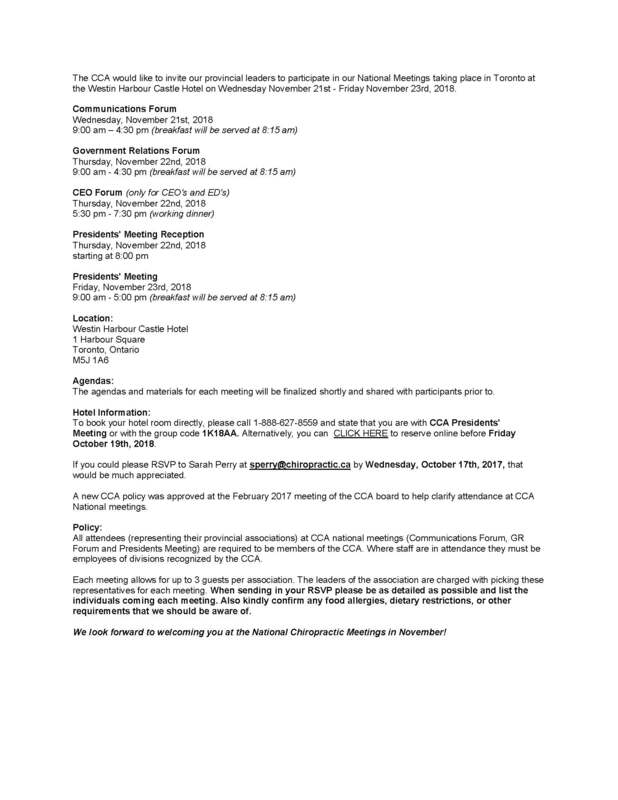 However, according to the Agenda for the meeting do not plan on attending unless you are a dues paying member of the CCA. That's because at the February 2017 meeting of the CCA board a new policy was approved " . 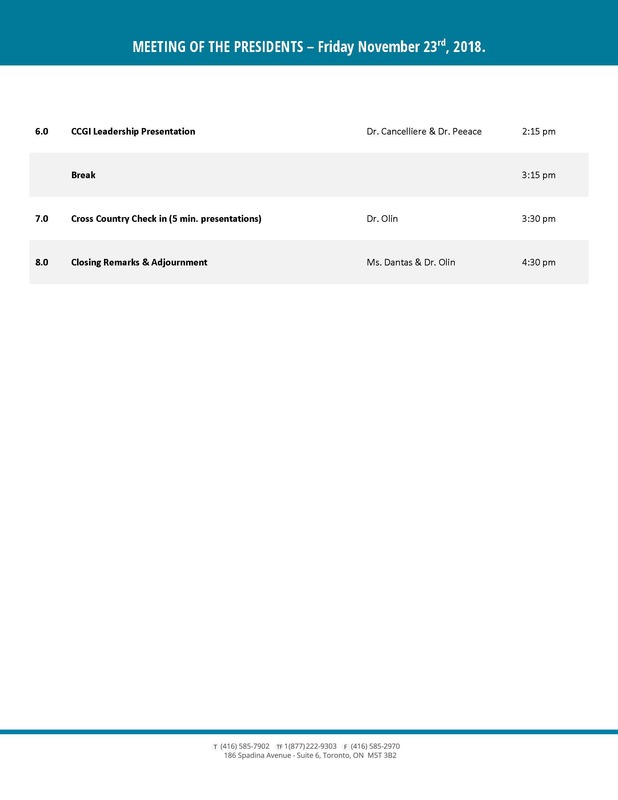 . . to help clarify attendance at CCA National meetings." All attendees (representing their provincial associations) at CCA national meetings (Communications Forum, GR Forum and Presidents Meeting) are required to be members of the CCA. Where staff are in attendance they must be employees of divisions recognized by the CCA. We have been reporting on developments in Canada involving widespread attacks by Provincial regulators who are going after chiropractors practicing in a salutogenic model focused on vertebral subluxation. David Wickes DC, the President of Canadian Memorial Chiropractic College (CMCC) was quoted at the last President's Meeting as referring to anyone practicing in a subluxation, vitalistic model as "the gangrenous arm of the profession that needs to be cut off". 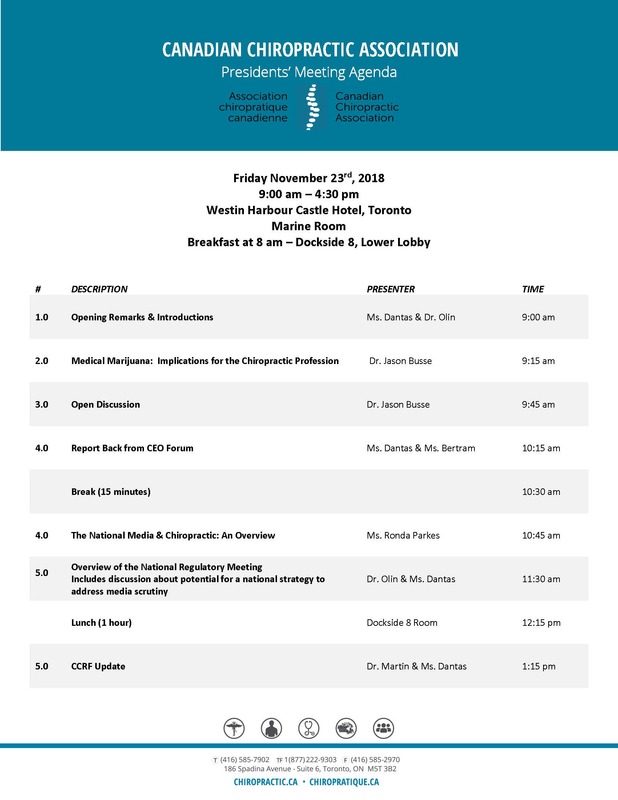 This represents a serious legal situation for chiropractors practicing in Canada since these meetings include representatives from the Provincial regulatory boards discussing government business and related regulations but requiring that you must be a member of only one specific trade organization in order to attend. Canadian chiropractors are now faced with a scenario in which active market players are gathering in closed meetings to discuss trade issues affecting the entire profession in Canada. This follows on the heels of obvious targeting by Canadian regulatory boards of subluxation based chiropractors' websites due to alleged violations of new Efficacy Claims Policies created by the regulators. In a shocking display those same regulators have ignored violations of the very same policy by the very members of those boards. Active market players holding closed meetings to discuss business that affects all licensed chiropractors in the country and making decisions that may inure to their benefit. All the while they are conducting what appears to be a coordinated campaign to eliminate competitors who are practicing in a salutogenic model.